When golfers take the tee at the 2015 U.S. Open, it will be at a course unlike any other to host the national championship. Chambers Bay is a links-style track constructed along Puget Sound just southwest of Tacoma, Washington, with wide fairways and only a single tree. 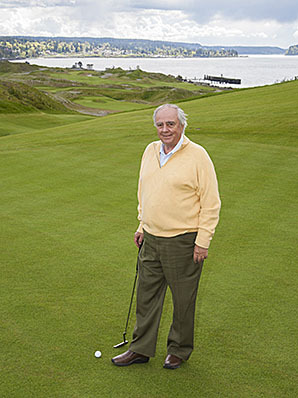 Chambers’ architect, Robert Trent Jones, Jr., has authored more than 270 courses in over 40 countries, across six continents. We caught up with Jones in New York to talk about the track, how it will play during the Open, and which players he thinks could come out on top. Here’s what we learned from our discussion. I like to say the site is the star, not the architect. We can use a site that is very generous, like the Monterey Peninsula, or we craft it. Chambers Bay is a man-made course, it’s set in a great setting in the Northwest, but it’s completely man-made. It’s entirely fescue-grass; it’s a maritime climate, very similar to Ireland or New Zealand, where it’s wet. And the idea is that fescue is like a table: when it’s right, it’s bouncy and has a trampoline effect. So the best players in the world can play an aerial game, they can play a ground game, or they can play both. There are a lot of options on this course. I don’t really have a favorite hole, but I have a favorite sequence, 14–18. Ask me my favorite movement in a symphony, and I would say [hums opening bars from Beethoven’s Fifth Symphony], but I also like the counterpoints. So it’s the whole song, the whole musical composition. And I use music as an example because rhythm is important. And it’s the rhythm of the course and the rhythm of the players on the course. You’re going to have to dance with this one for a while. 99 percent of the tees in America are flat, with a 1 percent grade for drainage. These tees are ribbons. I took the idea that all these big-headed guys just get up there with a big-headed driver, their bodies are in perfect shape, the ball is aerodynamic, and they just slug it. They’re completely thoughtless. They don’t care where it goes because it’s 300 yards closer to their target and they can get out of the woods as Tiger does. So I made uneven tees on purpose. They’re moving like a fairway. We’ve put thinking back into the tee shot. That’s my new defense. I borrowed from everything I know about golf. I’m a member of Pine Valley, and so I use big sandy blowouts and wasteland. I used 17th hole at Pebble Beach as an example for the 17th hole here near the sea. So I borrow, well actually, I steal. T.S. Elliot said good poets borrow, great poets steal. First of all, I think the players who will do the best are ones who are patient and tend to be perfectionists but know they can’t reach perfection, like Justin Rose. And they’ll have played British golf somewhere in competition and understand the invisible hazard. The wind is as much of a hazard as lakes or trees. So therefore, I would say, the people who would do well are obviously Rory (McIlroy), G-Mack (Graeme McDowell), Justin Rose, Martin Kaymer. I also think that, in this case, Phil Mickelson will do well, because he hits it wide and far and he’s good at chipping and putting around the green. And he wants it.